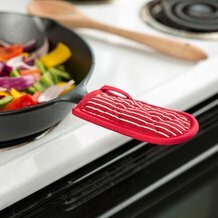 Protect your busy hands in the kitchen with Hot Handle Pads clad in a zippy stripe. Heavy padding creates a snug fit over pan handles. These are just what I needed! My young children love to help me cook and this makes me feel more at ease. I love them too! I have several cast iron pans and these little pads are perfect for the handles. The stripes are classic and so pretty. These are the greatest for cast iron skillets. Ingenious idea, if you have never seen or used them before. Easily stored in a drawer when not in use. I keep them on the counter by the stove when cooking and slip them on the handle only when moving the skillets or adjusting them over the burner. We use gas, so I DO NOT recommend just leaving them on the handle as you cook. The hang loop can burn, etc. 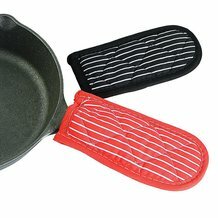 Just slip them on and off as needed when you move the skillets around. Excellent product, in my opinion (and after years of very active use of them). Initially bought a pair as a novelty to try out, but now have about 6 of them and they are an essential part of our cooking. Even my Japanese in-laws who balked at using cast iron due to the weight, now use my cast iron skillet as their main item. They love these handle holders, too. So neat and fit skillet handles like a glove. I love this. LOVE these handle covers. A friend of mine bought them from Lehman's as a gift for me, with high praises for them as a 'must have'. She was right! I use my cast iron skillet almost on a daily basis, and these handle covers are super nice to have. 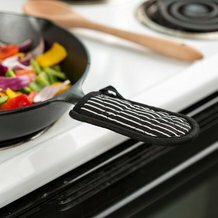 They fit perfectly over any of my skillet handles, and completely protect my hand from the heat. It's nice to have them on when my young daughter is helping me cook. I don't have to worry about her burning her hand because she forgot to grab a pot holder before touching the handle. Definitely a must have for anyone doing cast iron skillet cooking! Absolutely love these pot holders! Nice and thick but yes by all means watch leaving them on too near the flame, they will catch fire!!! I recommend just slipping them on as needed. I loved this until it unexpectedly caught fire one day. The flame did not look that close but clearly it was. Great idea but it is a fire hazard. These are great - they should come with every skillet. Now, instead of putting on an oven mitt every time I want to move the pan, I just pick it up. If you're handy with a sewing machine you could probably make something similar yourself, but at this price it's cheaper to buy them. A 'must have' for use with cast iron skillets! I wouldn't want to do without them!